Make the chicken and sauce: Combine flour, milk, eggs, butter and salt in a bowl. beat until all the flour lumps are gone. the consistency will be like thin pancake batter. set aside. Saute chicken and garlic on butter until golden brown. Pour in milk and cream of chicken. simmer. reduce to low to medium heat.After simmer, put the spinach and cheese inches keep stirring until the cheese completely melts. salt and pepper to taste. make sure the bottom wont stick. keep simmering until the sauce is reduced. Make the crepes: While the chicken is simmering, start cooking the crepes. in a lightly greased skillet, pour about 3 tbsp of batter and spread it as thin as possible. do not flip. in about 1 minute, check the bottom side of the crepe if light brown. cook only one side of the crepe or else it will be crunchy.By the time you're done with the crepes, chicken should be done too. pour about 3/4 cup of chicken on each crepe on the center. wrap each side. top lightly with Parmesan cheese. 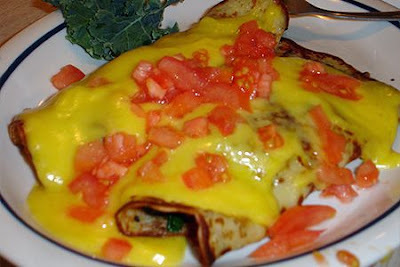 NOTES: The photo above was posted on the biggest menu website of the actual dish in the restaurant so it looks to have a hollandaise sauce and is topped with tomatoes. According to the IHOP menu the dish also contains mushrooms and onions so you may want to add those into the chicken sauce.